Apple or pear, knowing your body type and making the right adjustments to your exercise and diet routine can help you shave of weight more efficiently. When you think of fat, what first comes to mind is the bulge forming around your belly or a slight increase in thighs changing your pant size. The more you look at it the more you wish you burn it off like iron ore melting laser eyes. The first step to attacking fat like any enemy understands what it is and its nature. Not all fat is equal. Now that you are wishing to return to the world where "fat" is fat, it's time to get the point across to your body. Its time to start telling your fat, "Come out already, I know where your are," instead of the standstill, "Come out. Come out, where ever you are." 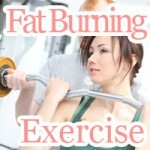 Now that the word is out, let's get started on exercising those nasty fats out of your body. In fact, there are different types of fats that you need to watch out for – the fat lying underneath your skin (Subcutaneous fat) and the fat surrounding you organs (Visceral fat). Knowing more when it comes to fat can help you in figuring out how to decrease you body fat by dieting and exercise. Which should you be more worried about, the fat under your skin or that under you muscles? Is thinking about whether your diet and exercise program is for the best causing you to rethink things lately? Think smart. Learn how you can up the results of your diet and exercise just by understanding more about fat. Figuring out your body type, to diagnose your fat! There are two fruits for the human figure which determine how you put on fat. People characterized by an "apple" shaped figure have more visceral fat which makes it harder to notice at first. Hearing this at first might make you start feeling lucky; however people with this body type if allowed to become obese run a risk of suffering from lifestyle diseases (Type 2 diabetes, heart disease, metabolic syndrome, ect.) leading for it to be keyed in as the "bad fat." On the other hand, people said to have a "pear" shaped figure have more subcutaneous fat causing it to be stored in areas of the lower body such as the waist, thighs, and buttocks. It is more prominent in woman. The fact that it is easy to stand out makes people with this body type often worry about their weight. However, pear-people run less risk of lifestyle diseases and complications than apple-people, which is why it can be referred to as the "good fat." Don't let the "goodness" of your body type bother you too much. Just because you are an apple doesn't mean that your fat is untouchable. Pear people too can keep their figure from protruding out of proportion. How you attack each body type to thin down and maintain your weight differs, so make sure you have a firm grasp on which one you are an apple or a pear. * Although there may be more apple-men and more pear-women that doesn't mean that there aren't any pear-men and apple-women out there. Does your diet and exercise program have the "right" stuff? Whether it is visceral or subcutaneous fat there are exercises designed especially to help you burn off that fat. Starting off doing the right exercises can not only save you time and effort, but also give you a smart-approach to trimming down that waist or thighs. See what's in store for you now! For apple-people, complications down the road can lead to a major headache, so to prevent that from happening we've put together ways you should change the way you diet and exercise, which are reforming your eating habits and exercise. Turn chewing your food into a habit! Conforming to diet restrictions (eating less than you want) isn't always easy. That is why you should chew your food more while eating. Just by chewing your food more it is possible to effortlessly reduce the amount you eat, satisfying your appetite faster than before. Not only does aid in digestion and absorption it also serves to prevent storage into fat. The best way to start cutting that hard to get visceral fat is to start pumping in more oxygen with aerobic exercise. For those less adept to exercise, it's recommended that you start with lower-burden exercises such as walking and yoga. Due to the fact that it takes as much as 20 minutes before fat starts to be burned off in your body, exercise for at least 30 minutes for best results. For pear-people, having fat stand out easier thinking to shave-off fat fast, avoiding a restrictive diet while putting on muscle mass doing anaerobic exercise, improving your metabolism, is most effective. Spend more time strength training! 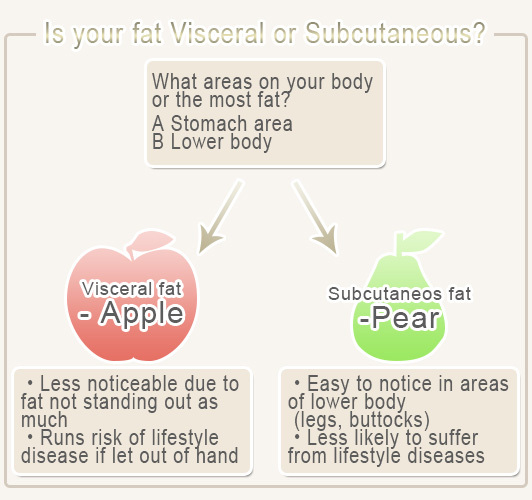 Subcutaneous fat unlike visceral fat, one put is a burden to lose. By strength training, strengthen muscles throughout your entire body, this boosts your metabolism. For women worried about putting on unnecessary bulk in muscle, strength training alone will not make your brawny. Get enough protein in your diet! While strength training it becomes necessary to accommodate for favor you are doing for your body that is to get enough protein. Not getting enough protein is where fad diets fail, causing muscles to tear away from body, your weight to drop, and unfortunately your metabolism to slow down. Avoid setting your diet up to rebound, make sure you get enough protein. Be open minded when looking for a protein source. Besides what your intuition tells you (meat equals protein) there are other places to look, such as soybean products or supplemental whey protein. Chow down and get the protein your body needs, then you'll be on your way to building a body less prone to putting on fat and shapely to your nature. 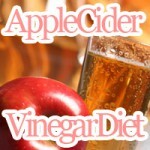 Drinking apple cider vinegar daily may help you curve your appetite and burn fat. The best part is its only 2 tablespoons of vinegar. Don’t forget to mix with water. Just because you are not losing weight doesn’t mean you aren’t getting slim. As dieters that know healthy weight loss diet tips know, weight isn’t everything. What are healthy fruits for eating to lose weight that you should add into your fruit diet plan? The list is endless. With nutrition you can diet smarter starting today. Do you feel like your thighs are taking over your legs? When your hormones are causing thigh meat to turn into an emerging power in your body, you need all you can get. Exercise and dieting combined with this massage gives you what you need to take back your legs! 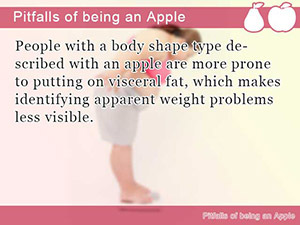 People with a body shape type described with an apple are more prone to putting on visceral fat, which makes identifying apparent weight problems less visible. 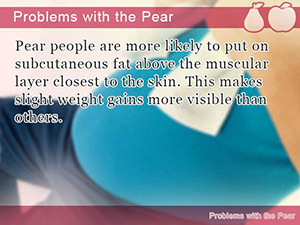 Pear people are more likely to put on subcutaneous fat above the muscular layer closest to the skin. This makes slight weight gains more visible than others. 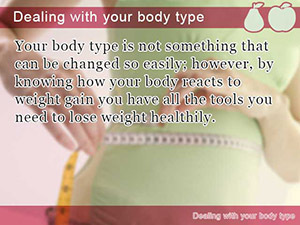 Your body type is not something that can be changed so easily; however, by knowing how your body reacts to weight gain you have all the tools you need to lose weight healthily.